There are several ways to hit the ball in shinty, the main differences being where one's hands are on the caman and how far and hard you want the ball to go. 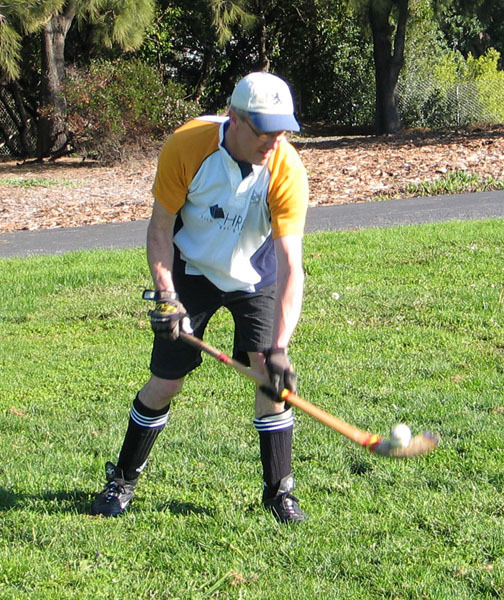 Flipping or Picking up the ball: With the hands apart it is easy to hit or flip the ball over short distances. The advantage here is that there is little or no backswing, the impetus is provided more by flicking the wrists than by arm swing. The photo above shows the ball almost being picked up on the caman, but this type of ht can easily be used for ground shots as well. We have seen a few players who have used the hands-apart position to hit the ball with power (think of a slap shot in ice/street/field hockey), but this is not the common approach for driving the ball with force. For that one should bring the hands together at the top of the caman in a grip approximating that used by baseball batters or golfers (but DO NOT intertwine your fingers! ), see below. FULL SWING: In this approach it is appropriate to use a backswing and follow-through (3 o'clock to 9 o'clock, or 9 to 3 varying with the side on which you are hitting), something like a golfer might do. During this swing there should be a weight shift onto the front foot. With either of these approaches to hitting it is extremely important to keep your eye on the ball - you should already know where you¹re going to hit it before beginning your swing! NOTE: Remember, it is more important to make good contact with the "sweet spot" of the caman than to muscle-up and try to slam the ball - let the caman do the work for you. You will be surprised at how much pace you can put on the ball with an easy swing and good contact! TIP: The trajectory of your hit will vary depending on what type of stick you are using (forward, midfield, defender, keeper) and where in your swing you make contact with the ball. For instance, if you make contact with a ball which is nearer the front foot in your stance you will tend to lift the ball, but if the ball is closer to your back foot you will tend to hit it on or close to the ground. HITTING PRACTICE ROUTINE: A good way to practice hitting is to get a few balls (the peewee league safety balls are excellent for this exercise, or even tennis balls) and set up in front of a chain link fence, making sure the holes in the link are smaller than the balls you are hitting! Place yourself a stick length plus a few feet back from the fence and set your balls out in a row. Take nice easy swings and concentrate on making good contact - you will feel the difference between a good connection and a duff. Take it easy and don¹t overdo your swing. After a few repetitions the swing will begin to feel natural and you will make more consistently good contact. As you improve move the balls further apart so you are moving more between hits - this will help prepare you for hitting the ball on the move. And make sure to work on swinging from both sides - in shinty it is important for your off-hand swing to be as strong as your natural side!